Anne's Food: Happy Birthday Dear Blog! Preheat the oven to 200 degrees Celsius. Butter and line a 24 cm springform. 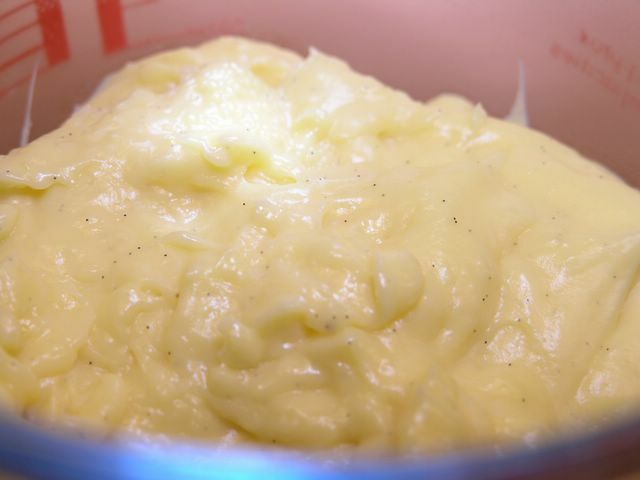 Beat the eggs and the sugar lightly, then place over a hot water bath and beat vigourously until very very fluffy, and slightly hot to the touch. (This takes quite a while, even with electric beaters.) Carefully fold in the flour. Place in springform, and bake for 15-20 minutes, use a cake tester or the tip of a sharp knife to check for doneness. Take out, release from springform, place on a rack and place the springform inverted on top while it cools. Score the vanilla bean and scrape out the seeds into a saucepan. Add the milk - and the bean - and bring to a boil. Remove from heat, and let the milk infuse for ten minutes. (Put a lid on top.) Meanwhile, mix the egg yolks with cornstarch and sugar. When the milk is done, remove the vanilla bean, and pour the hot milk over the egg mixture. Mix well, and pour back into the saucepan. Bring to a boil, stirring CONSTANTLY. It will thicken a lot all of a sudden. Remove from heat, and quickly beat in the butter. Then press through a sieve into a clean container, straight away. Cool quickly, preferrably in a cold water bath. 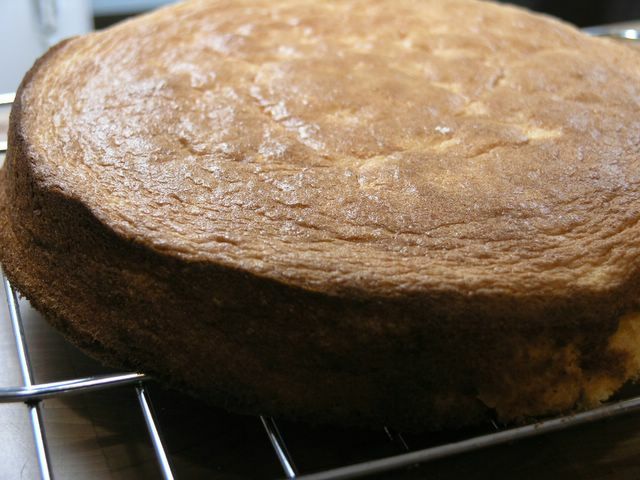 Divide the cake into two layers. (Or three, if you're up to it.) On the bottom layer, start with a very thin layer of jam. (Use your favorite - I'm using a seedless raspberry-violet jam from Christine Ferber.) Follow with a thick layer of custard. Add a little bit of whipped cream. Top with the second layer. Again, use a little bit of jam. Mix the remaining custard with a little bit of whipped cream. Spread this on the second layer. Try to make it slightly rounded, higher in the middle. Top this with the whipped cream. This time, be very careful about shaping. Top - careful, careful - with the marzipan lid. Decorate as you wish. Hey, congratulations. That's a lot of posting. Congrats! Time flies by.. Puh.. One whole year. Keep up the good work Anne! 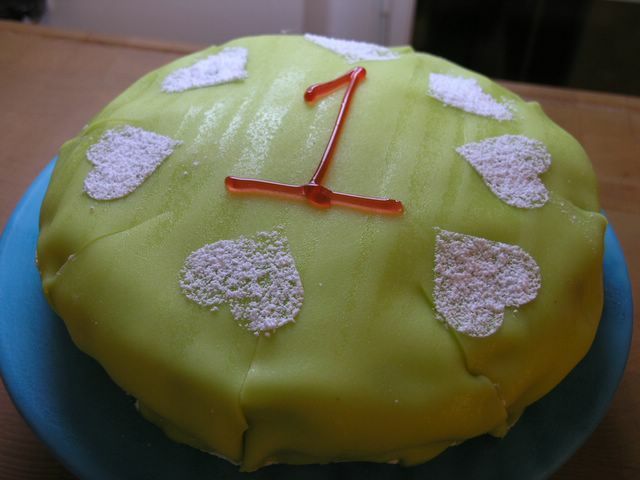 The cake looks gorgeous - I think Prinsesstårta was one of the first "pretty cakes" I ever tried making - I remember because I colored the marzipan myself and it took FOREVER to incorporate all that food coloring into the pretty large amount of marzipan... it tasted superb though! I hope to keep reading for a long time to come; I do love popping to read what you're up to. Zarah Maria - still very much thinking about it... haven't bought it just yet though! And I could NOT bear the thought of rolling my own marsipan for this.. sigh, next time. Or not. Niki - aww, exotic Sweden indeed. :) I love reading your blog too, and I hope we'll both keep going for a very long time! Cool - Tina has a show here in Sweden too, and I'm actually not so fond of her, but some of her recipes are very nice. I hear that the international show has been pretty successful! Hipp hipp hurra! You are the Queen of all Swedish Foodblogs! Grattis Bloggen! Blev det någon present? Happy Birthday, Anne! It's always a joy to read your posts. Thanks for sharing the recipe for the Princess Cake too. I'm not a fan of marzipan so I may skip that step! Niki isn't the only one who remembers the original name! Happy Blog Birthday, Anne. I hope you keep it going to a long time yet. Massor med grattis på din bloggfödelsedag! Jag fattar inte hur du orkar hålla tempot uppe med nya inlägg varje dag - starkt jobbat! Congratulations!! Here's to many more posts. I just started last week, myself. Happy Blog Birthday, Anne!!! You're doing a fantastic job with your daily posts and great recipes!!! thank youuu for the recipe!!!!! Glad midsommar till dig Anna!!!! I've just dscovered your website by searching this recipe.